We’re delighted to announce that we will be presenting a stage at this year’s The Great Escape Festival! With less that one month to go until The Great Escape kicks off in Brighton, over 100 more artists have just been announced, plus the line-up for the notorious Late Escape has been revealed. The festival’s full schedule has finally arrived, and we’re extremely excited that the 100+ recently announced acts that will be playing this year’s TGE include massive emerging artists such as Pumarosa, King Nun, YAK + many more. 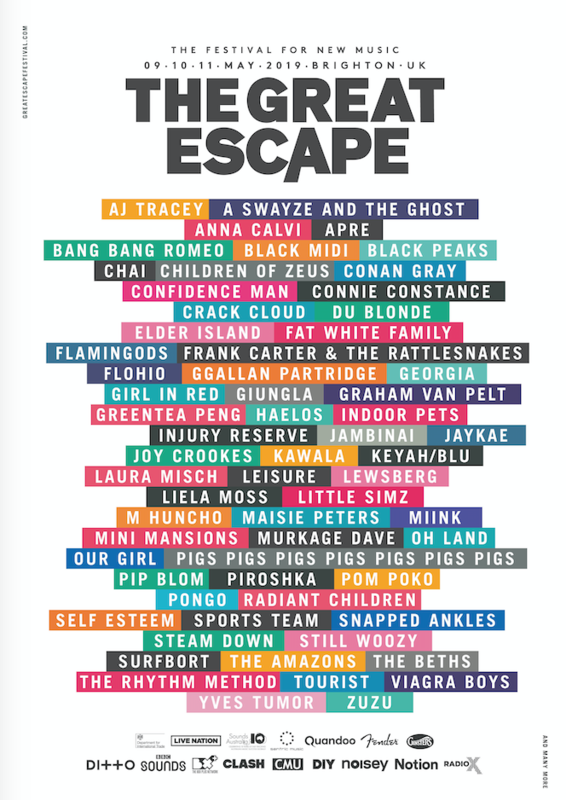 The Great Escape is widely considered to be the festival for new music and will be kicking off festival season by playing host to over 450 up-and-coming artists and a music-led conference across 35 walkable venues from 8-11 May. It’s an incredibly exciting opportunity for us to be able support such incredible up and coming acts, as well as more well-known names such as Frank Carter & the Rattlesnakes and itoldyouiwouldeatyou. Tickets can be purchased here, and prices start at just £75. Come along and join Punktastic over the course of the weekend as we celebrate the best in new music.